Hurley Engineering is proud to be a partner in your facility and we are proud to offer, simply, the best booster system on the market. The Grundfos Hydro MPC-E a.k.a the Grundfos BoosterpaQ is "hands down" the best booster system on the market and we would like to support your investment by enrolling you in our new Grundfos B.L.O.G. Onsite tech visits twice a year to review operation, check alarms, monitor run times and functions and review any mechanical upgrades or maintenance issues that might need to be addressed. Training sessions: Free training sessions to make sure that new staff is trained properly on the equipment features and operations. Refresher updates for experienced staff is also offered. Software upgrades: Free software upgrades to the existing PLC (CU351 or newer) will be completed when possible at no charge. Exclusive B.L.O.G. Newsletter keeping your team up to date with the latest technology and learning opportunities with Hurley Engineering and Grundfos. The Wells Fargo Building was the first major success story in the Pacific NW for Hurley Engineering and Grundfos BoosterpaQ. The original Wells Fargo Story is in the link provided (WELLS FARGO) and below are comments from our customer about the current status of his system and his experience endorsement. "The only thing wrong with the Grundfos Hydro MPC-E BoosterpaQ is that is is so reliable that I don't get to visit with my Grundfos Rep. The system has been installed for over 12 years and has performed flawlessly. The only major upgrade we did was to install a multi-drive panel to maximize our energy savings. Before I changed to the Grundfos BoosterpaQ I had so many problems with old system that when I installed the new Grundfos BoosterpaQ I installed an overhead rail & hoist system so that one mechanic could remove and repair pumps by themselves....The hoist has never been used. Grundfos and Hurley Engineering helped us to "Right Size" the replacement system during design and I fully believe that it is one of the reasons the system has performed so well over the last 12 years. We run our system 24/6 365 at a discharge pressure of 305 psig and that is hard on most systems. Not ours!" 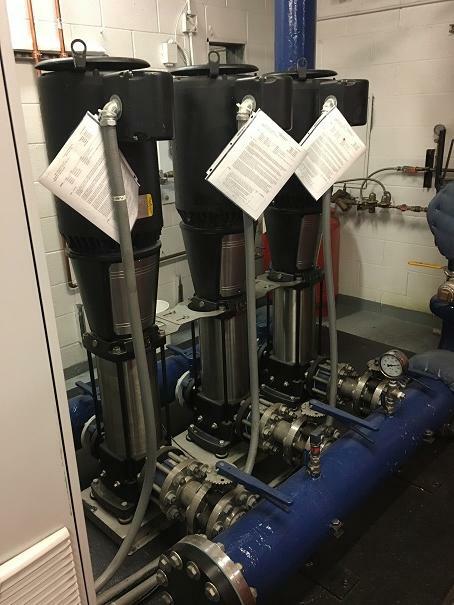 The Kimpton Monaco Hotel recently came to Hurley Engineering with an opportunity to look at their aging booster system. 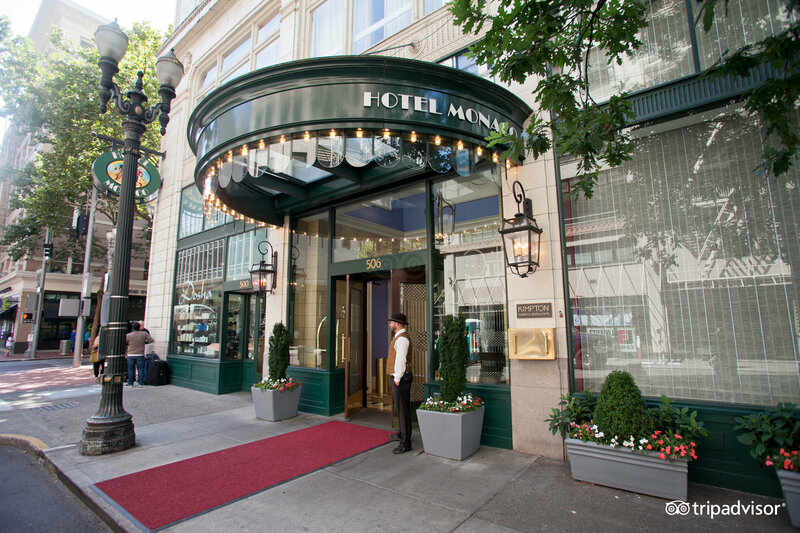 As an allied partner with Energy Trust of Oregon we worked with ETO and The Kimpton to perform and "Energy Audit" which resulted in a 50% incentive offer towards the total cost of the project. The project is compete and the Kimpton is now a member of the B.L.O.G. Once the initial start up is completed by our Grundfos ASP Team and the facility has registered as a B.L.O.G. member a QR Label will be added on both the outside of the Grundfos BoosterpaQ panel and on the inside of the panel. The QR code contains a link to the SPECIFIC DETAILED INFORMATION ABOUT THE INSTALLED BOOSTERPAQ. This includes Installation and Operation manuals, Parts Guides, Bill of Material (BOM), Start Up Reports, and Maintenance Schedules. This is invaluable information for all maintenance and operation staff onsite. Energy Audit or Pump Check? It is simple really an Energy Audit can be used for larger pumps or a pump system like a domestic water booster or a central utility HVAC system. On larger equipment or packages a Grundfos ASP service technician will install monitoring equipment to gather the necessary power and flow data to construct a comprehensive cost savings and "right size" system operational report. Here is an example of a cost savings Energy Audit as commissioned by Martin Selig Real Estate. On the other hand a Pump or System Check is a quick inexpensive way to work with an ASP representative to gather the pump, motor, and operational data to come up with an estimate of potential savings and equipment optimization before moving to budgeting or project management. NEED A PUMP QUOTE OR A SERVICE TECH? Being a B.L.O.G. Member Gets you to the front of the line! Hurley Engineering is the Pacific Northwest Authorized Service Partner with Grundfos and ALL Grundfos Products including GRUNDFOS, PACO, PEERLESS, AND YEOMANS PUMPS. *minor details. The offer of goods and services listed above is for equipment sold within our contractual markets with our manufacturer's. This offer is meant as goodwill for customers that have purchased the listed equipment from Hurley Engineering, one of our supporting mechanical contractors, or plumbing suppliers. Hurley Engineering reserves the right to review all membership qualifications before offering membership.